Out of all the online casino games, slots is without question the most popular. There are literally hundreds, if not thousands of games for players to choose from. Golden Lotus is a game that is well worth your time, offering a beautiful theme, easy to learn gameplay, and modern graphics. Let’s find out exactly what this game has to offer you. Golden Lotus was developed by Realtime Gaming. Immediately you will notice the oriental theme, and you’ll likely fall in love with the colorful symbols and vibrant backgrounds. The Lotus flower is used for both the wild symbol (gold lotus) and the scatter symbol (white lotus). Japanese characters are put to good use, denoting the Golden Lotus logo in calligraphy style. Other oriental flavors are found throughout the game with symbols like the Geisha, a traditional urn, Japanese chimes, and others. Of course there are the traditional slot symbols to be found in the game too, so you don’t need to worry about a steep learning curve. There are typical card value symbols running from Nine to Ace. In addition to the slot movement animation, the Wild and Scatter lotus symbols are also animated. Any time that these feature on a winning line you will be treated to a closed lotus bulb budding into full bloom. If you’ve played any online slot game, or even a slot machine in a land casino, you will feel right at home with Golden Lotus. The game is based on 25 paylines, and these can be adjusted by a button below the reels. Coins are used for in game currency, and the bets range from 0.01 to 5.00 coins. There’s a decent spread here to customize bets, however you will be limited to a single coin per payline. Online slot games are well known for incorporating bonus screens and mini games within the standard slot game. Golden Lotus is no different, and you will find two bonus games within the virtual machine. One of them is the Chinese Garden mini game. You can unlock this screen any time that your spin reveals three golden lotus symbols. They don’t need to form a pattern and can appear anywhere on the reel. Inside Chinese Garden there are 8 golden lotuses on screen. You can choose four of these to claim a reward. The rewards vary from a multiplier on your bet, to free spins. The free spins are especially rewarding because payouts are tripled on these bonus spins. The other bonus feature centers on the white lotus. Like the Chinese Garden, this game starts when three white lotus flowers appear on your reels in any order. When this happens, you’re automatically given 8 free spins, along with a random multiplier. Payouts can be from 3x – 5x that of a standard payout, depending on the multiplier that appears. 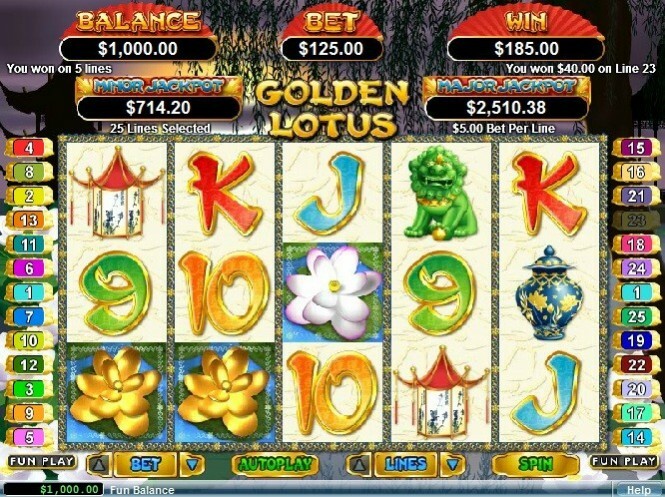 Golden Lotus is both a progressive and standard jackpot game. Standard jackpots are set at 8888 coins, and can be won with lines of the Golden Lotus symbol. Progressive jackpots are random, and you have the chance to win on any spin. This is a nice touch and keeps things exciting during gameplay. The oriental theme is the standout here, and it adds a level of immersion and authenticity. Gameplay is smooth and easy to follow, and there is variation to be found when it comes to betting with the paylines and various coin sizes. If we had to choose a single complaint, it would be the lack of creativity in sound design. There is no background music throughout the standard game, and the sound effects are simply ‘ok’, without offering anything outside of the ordinary. Lotus Flower is the kind of slots game that we have no trouble recommending. Striking graphics, a unique theme, and compelling jackpots and bonus features make it a game well worth your playtime. The fact that it lets itself down on sound implementation is disappointing, but takes little away from the overall experience and excitement that you can have with this game.